Most people who workout love training their arms; rarely do you here of somebody skipping their arm workout. You never see somebody walking around with large muscular legs and skinny arms. In fact, it’s just the opposite. This is in no small part due to the fact that no other body part exemplifies strength and development, and is the envy of others like a muscular pair of arms. In the following article I walk you through one way to properly bang your your triceps to new growth. All too often, a personal trainer or instructor will isolate a particular muscle so much that it becomes detrimental to the workout. You may be asking, “How can you isolate a muscle too much? Isn’t that what all the magazines say to do?” Yes, that is what a lot of magazines tell you to do, and I agree it’s good to isolate the muscle being worked. I’ll even go one step further and say that it is not only good but also absolutely necessary for optimum muscular growth. However, many instructors and fitness enthusiasts are so concerned with isolation exercises that they’re neglecting form and function. How does form and function relate to triceps training? Let’s look at what the triceps actually do. The triceps extend, or straighten, the arm. For example, without your triceps it would be virtually impossible to grab a beer from the fridge. That would truly be a tragedy. Without triceps, your arm would be in a constant flexed state. This having been said, exercises that stress movement only at the elbow (such as triceps pressdowns) are solid movements. However, I am starting to see less and less multi-joint movements used in workouts. Examples of multi-joint movements for the triceps would be close grip bench presses, dips and a few others. These exercises involve not only the elbow joint but the shoulder joint as well. When it comes to building an impressive set of arms, the triceps cannot be overlooked. 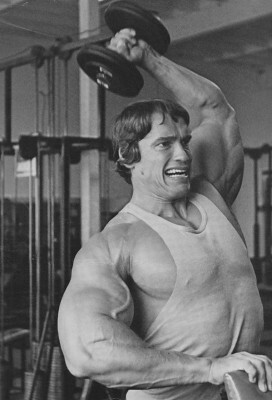 Consisting of three different heads, the triceps contributes to more than half of an arms circumference. Though large biceps are striking, it’s the triceps that give the upper arm a thick powerful look. Irrefutably one of the best ways to add size to your triceps is to perform triceps extensions. If you’re like most who’ve been working out for a year or more, you’ve tried various extension movements. More-over you probably like performing extensions, whether overhead or lying, but your elbows hurt when you use any appreciable weight for a period of time. Are you tired of elbow pain getting in the way of progress when performing effective exercises like triceps extensions? Are your triceps lagging behind in size? have you reached a plateau in arm development? Are you looking for an exercise to stimulate growth? If you answered yes to any of the above questions, I have the exercise for you. In an article discussing the ten best exercises, the California press is mentioned as being one of the best triceps exercises for size and strength. I’ve been using this particular exercise on and off for many years and can attest for it’s effectiveness. I’ve always attained great gains from performing triceps extensions, especially lying supine, but had to stop performing them due to pain. No matter what angle or bar I would use, as soon as I would start using heavy weight, it always resulted in pain in the triceps tendon. As a matter of fact, I developed tendinitis several times, which I’m sure many of you know, can be difficult to get rid of. Once I started to incorporate the California press into my triceps workout, I found I got the benefit of lying extensions without the wear and tear on the elbows. In fact, you’ll soon find the California press is a much more effective exercise than extensions because you can use a much heavier load; this will result in a much greater stimulus, which will yield a greater adaptive response. If you’re interested in trying the California press go to bullz-eye.com. The Push-up. Switch it up.